Every set of terrain needs a collection of small “scatter” pieces that can be mixed in amongst the larger pieces. These little pieces add texture to the battlefield and can make a big difference in how the battle flows by blocking off lanes of travel, or just by adding a little bit of cover to help units cross a heavy firing lane. 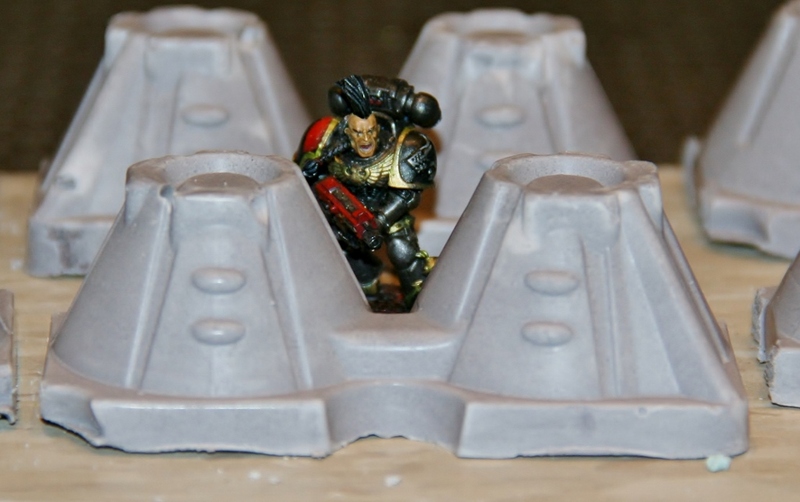 Tank traps are a great example, and an easy one to add to your collection. Tank traps have come in a wide variety of forms throughout history, and there are just as many ways to add them to your table. In my case I’ve decided to cast them in plaster. because it’s easy to find and fairly inexpensive. I know there are higher quality plasters out there, but this works well enough for me. I like to mix some coloring into the plaster. By mixing the color into the plaster I ensure that it will still be colored even if it gets chipped or broken later on. I also like to mix some sand into the plaster to add strength and a little heft. This is similar to adding gravel to cement to make concrete. 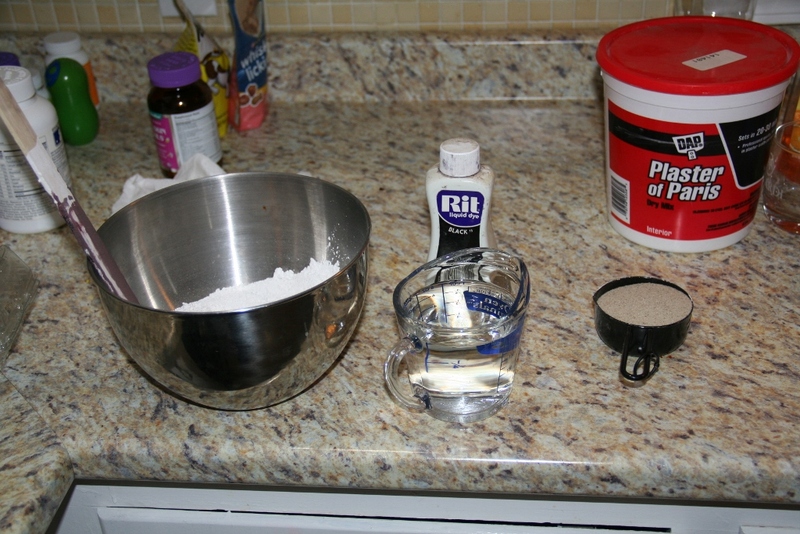 Per the manufacturer’s instructions, I mix two cups plaster to one cup water. I add 1/2 cup fine sand to the mixture. For coloring I used some old black fabric dye that I had sitting around, but paint should work as well. I stir in the coloring until I get a grey that I like. This stuff sets up fast so you have to work quickly. Make sure you have all of your ingredients and your mold ready to go before you mix anything. 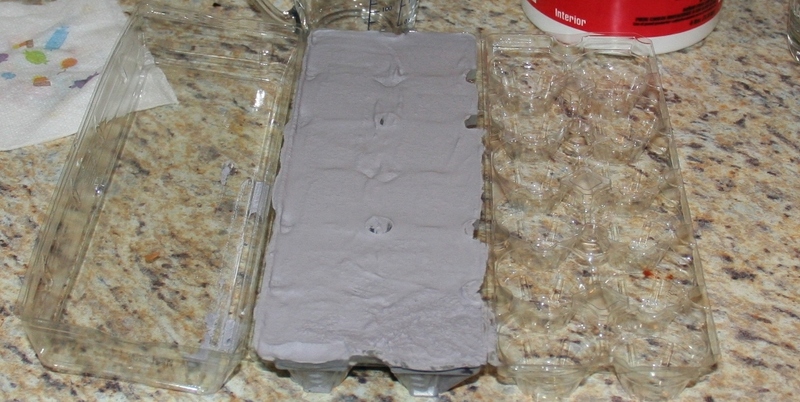 For a mold I used this plastic egg carton for the tank traps. This had three sections to it. The eggs sit in the middle section, the right section sits over the eggs to keep them in place, and the left section goes over that to hold it all together. It seems a bit elaborate compared to the standard paper ones but I’m not complaining! The right piece has 12 identical pockets that would make good tank traps, but I decided to use the bottom because it had some more interesting variation. I simply mixed everything together and poured it into the egg crate. It sets up in about 30 minutes, but I waited an hour just to be sure. I neglected to lubricate the mold but the plastic is flexible enough to pop out the pieces without too much trouble. As you can see I got three different shapes of tank traps from this cast. These are about as tall as a typical infantry figure, so the barricades on the left actually block line of sight to infantry behind them, and will grant cover to most vehicles. The others allow line of sight, but still offer good cover. on these tank traps, but when I get around to buying more I plan to cast the other side of the egg carton to add another 12 individual pieces. 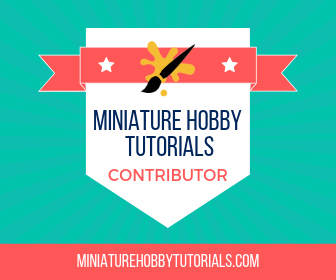 If you’re looking for some more cheap and easy terrain features to add, check out my tutorial on making barbed wire as well as easy miniature trees, and also my tutorial on a cheap wargaming table. Also, check out Thor’s list of essential hobby supplies. How’s that for a fast, easy, cheap way to clutter up your battlefield? Agreed, that’s awesome. Clever idea with mixing in the paint too. I’ve used plaster for a few terrain pieces like this, small detail pieces, and it works great for it. It’s cheap and holds up well. What an awesome idea!! Holy crap! So great! Thanks! I’ve seen decent results with ice cube trays as well, if you can find the right size and shape. Kinda funny how “organic, free range” eggs like that company sells come in so much plastic, eh? At least you’re able to repurpose it! Good idea. I have no use myself for them but I could make some to donate to your table and do a tutorial out of it. I’m not too proud to accept donations! I think they would add a lot of interest to some of the larger bases too. Good point. I’ll have to try some out next time I do a big base. I tend to default to rocks on bigger bases, time to mix it up. I’m in danger of repeating myself, but there are some amazingly creative MOFOs out there! I agree. One of the best things about the internet is being able to find all of the great ideas out there! It’s fun to share my own once in a while too. This is good stuff for me, especially since I’m starting fresh with no shops close by. My dining room table may very well be the only battlefield I can find for the next few years. Thanks! This is a quick and easy way to fill up some of that empty space on your battlefield. I hope it helps you get back into playing in your new location. Have you been able to find new players in your area? I was actually surprised to find out that a handful of the younger guys at work play, but they are all just getting started and don’t even have much put together yet. Which is just as well because so far we all work different shifts so finding time would be difficult. But at least I have some players, so Objective One is accomplished! It must have been a bit of a relief to find some available players. It’s lucky for them to have a veteran gamer show up to guide them, but now you really need to make sure you get a table and terrain put together! well, right now we work on different shifts but hopefully once i get back to days our schedules will align a bit better. then i need to make something happen, cuz all work and no play makes Jack go crazy with an axe in haunted hotels! Wow, that’s handy-dandy! And that gorilla tape’s not messing around! Thanks, man. Its worked out really well so far, its nearly a year old!